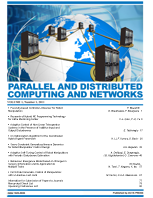 This is an interdisciplinary journal covering all areas of parallel processing and/or distributed computing and networks that apply to the engineering and computer technology communities. The interdisciplinary approach of the publication ensures that the editors draw from researchers worldwide in a diverse range of fields. The scope of PDCN includes: algorithms, broadband networks, cloud computing, cluster computing, compilers, data mining, data warehousing, distributed databases, distributed knowledge-based systems, distributed multimedia, distributed real-time systems, distributed programming, fault tolerance, grid computing, heterogeneous computing, high performance computing, interconnection networks, Internet tools, many-core computing, memory and I/O systems, mobile computing, modelling and simulation, multi-core computing, operating systems, parallel computing systems, parallel processing and programming, performance evaluation, personal computing, planning protocols, real-time and embedded systems, reliability, resource allocation, reusability, routing, scheduling, supercomputing, web technologies and wireless networks.